Every once in awhile, you come across a book that resonates such truth that it compels you to pause and reevaluate your decisions; and then inspires you to implement significant yet necessary changes in your life. 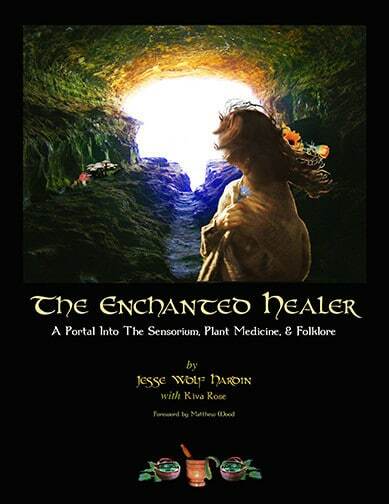 Let me introduce you to Jesse Hardin’s The Enchanted Healer: treasure map to your soul’s desires, field guide for identifying your authentic self, and handbook for transmitting your message to the world – unadulterated. When – not if – you read this book, prepare yourself for a journey that may take some time. Jesse Hardin’s The Enchanted Healer will accompany you along a quest that is equal parts educational, inspirational, and transformational. As your guide along this journey, Hardin reacquaints you with the enchanted world that is all around us: a world that appears mundane if only for our inability or unwillingness to tune into our senses and wake up to the present moment. He offers numerous strategies and practices for excavating the scripts that prevent us from fully embracing our authentic selves. He then helps us follow those breadcrumbs back to our wholeness. This is the truth-telling, paradigm-shifting, honesty-inducing book we’ve all been waiting for. One of the key takeaways from this book is the importance of embracing the present moment and having a heightened awareness of our surroundings – a philosophy that is endorsed by numerous somatic therapies and spiritual traditions around the world. His application of these practices in the context of healing modalities offers a fresh perspective on why sharpening our sensory awareness is of utmost importance: “It is crucial for healers to not become complacent, inured, or for any reason get in the habit of feeling less and numbing out more. The efficacy of our lives and practices hinges on our sensitivities, our innate and developed senses, our ability to notice, feel and respond” (p. 83). The Enchanted Healer is truly a guidebook; Hardin illustrates several techniques and practices that modern health practitioners can use to support their journeys back to mindfulness and awareness. These techniques are simple, but not necessarily easy, and Hardin’s teachings have a way of getting to the heart of everything you’ve been avoiding in a refreshingly disarming way. The work is clearly laid out, and the journey awaits; the only way out of the darkness is through the tunnel of transformation. Healing the healer is an ambitious task, but Jesse Hardin’s The Enchanted Healer boldly embraces the challenge, and the result is quite remarkable. Even the seasoned self-help junkie will encounter new tools and techniques for the soulful introspection and mindful exploration of new terrain. These include such things as story, sexuality, totems, and sacred indulgence to name a few. A common thread connecting these various healing modalities is the importance of releasing limiting beliefs and re-patterning the stories we tell ourselves in order to activate meaningful changes in the world: “The effective healer will be the one who not only senses and comprehends who and what they are trying to help, the clients, medicines and the illnesses, but who also knows intimately the extent of their own healing knowledge and skills, the limits of their comprehension or abilities, their habits and filters, feelings and needs, motivations and style.” (p. 111) From this standpoint, anything is possible including the conscious creation of our selves, our communities, and our healing paradigms. One of the most poignant elements of this book is the soul-shaking contribution of Kiva Rose. Rose brings a raw authenticity as she shares her personal journey through the tunnel of metamorphosis and self-discovery. She notes, “If we are untrue to our own nature, we cheat both ourselves and those we seek to help. While adaptation to new circumstances can be not only necessary but commendable, it must not be at a cost to our integrity as medicine people and allies of the plants.” (p. 255) Her beautiful and moving prose effectively illustrates how going against the grain can be a powerful expression of love and creativity, especially when it reflects the true desires of your deepest self. The Enchanted Healer is best read with your heart wide open, senses alert, and mind flexible enough to allow for changes to occur. This book invites your authentic self to play a central role in your work as a healer; work that matters because it offers a profound opportunity for you to share your deepest gifts with the world. I found The Enchanted Healer to be a refreshing rule breaker and paradigm shifter, and arguably one of the most thorough guidebooks for transformation in the contemporary herb world. So consider this: are you ready for change and open to receiving transformation? If so, get your copy of this must-have book and embark upon your own journey towards finding your true medicine. If you’d like to subscribe to the free Herbaria Newsletter by Jesse Hardin and Kiva Rose, then please visit this page and click subscribe on the left hand tab.